sailboat. 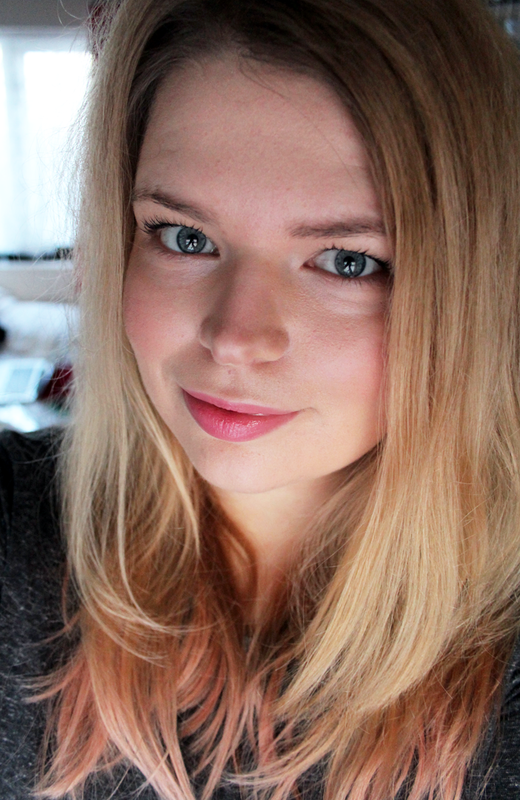 : Life: Christmas shop, a face of the day & a giveaway! Life: Christmas shop, a face of the day & a giveaway! It's been a really long time since I last did a face of the day, I forgot how difficult it is for me to take a picture of myself where I don't look odd. As soon as the camera is pointed at me I seem to gain three extra chins and lose the ability to smile without looking like a crazy lady! I used to dread the morning after the night before when all the pictures would be uploaded to facebook, all my friends would be there looking stunning in every picture and then there would be me, looking like a gargoyle in the background (I'm kidding, well.. a little!) - I'll have to dig a few up to show you one day! Bourjois might just be the brand that does my favourite foundations, thank you healthy mix (& a decent layer of concealer) for making my skin look way better than it actually is. I'm still loving the Maybelline Fit Me powder too, that stuff is seriously amazing! How it doesn't look cakey, even when I put a lot on I don't know. Actually, Maybelline are really doing well right now I think, I'm really enjoying the Sculpting Brow Mascara from this month's GlossyBox*. Even though it's not quite the right colour, if I just use a little I think I can get away with it! It's pretty cold outside now and I've been bundling up in my favourite coat that I bought from Matalan, my Gryffindor Scarf (house pride!) 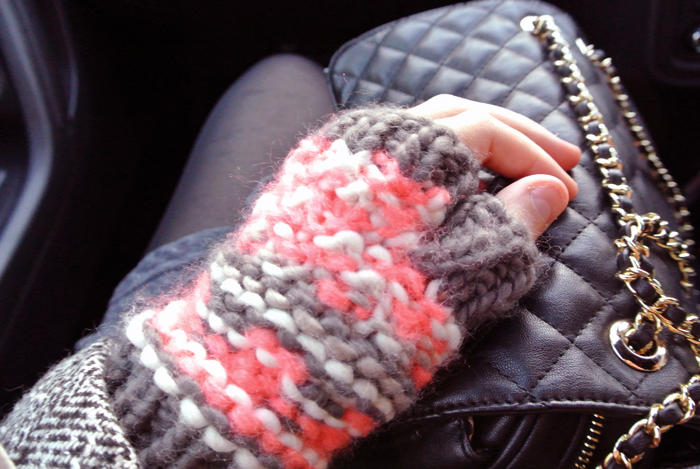 that I bought at the Harry Potter Studio Tour earlier this year and my favourite chunky knit mittens from New Look. 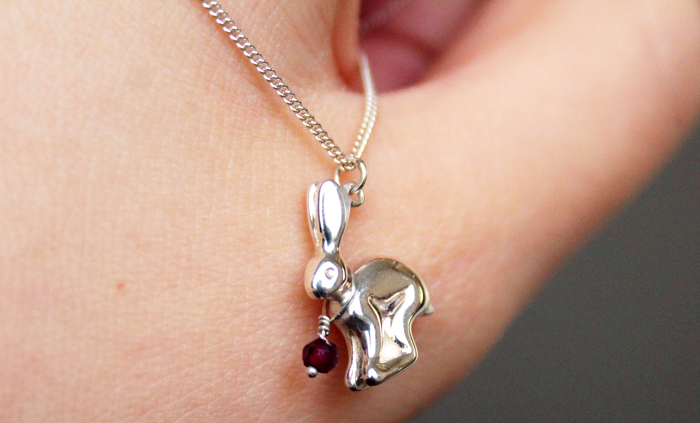 Even though it was hidden underneath my scarf, I also wore this sweet hare necklace* that was gifted to me from Jana Reinhardt. Their pieces are seriously stunning, so simple and elegant. If something catches your eye, be sure to use the code blogger20 to get £20 off all full priced pieces - I'm not getting paid or anything to mention this, just wanted to share! I often forget how lucky we are to be surrounded by such beautiful countryside, it's something I need to stop taking for granted and instead get outside and explore it next year. We had a little bit of shopping to squeeze in before Christmas and Mark had to find a seasonally appropriate jumper to wear to work over the next few days. We're excellent at leaving things until the last minute over here! 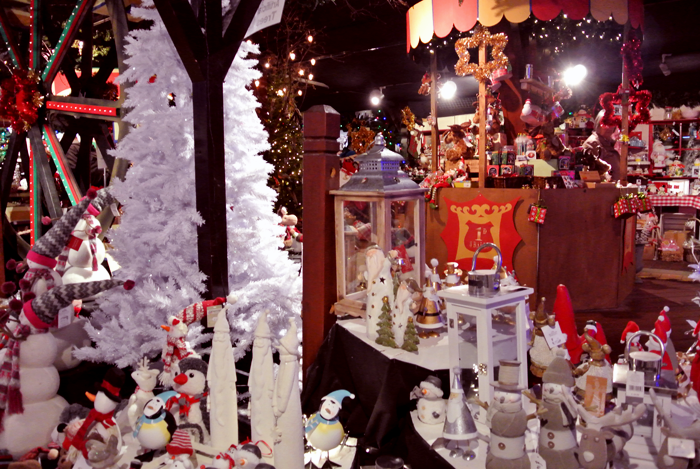 We also stopped by the Christmas shop in our favourite garden centre (yes, we have a favourite - pass us our walking sticks and slippers already!) but you know, that place is pretty magical inside during November and December. I fell in love with this beautiful light-up Victorian street scene. They have these every year and I always manage to talk myself out of buying one - I think next year I'll have to get one though and maybe pop it in our front window. 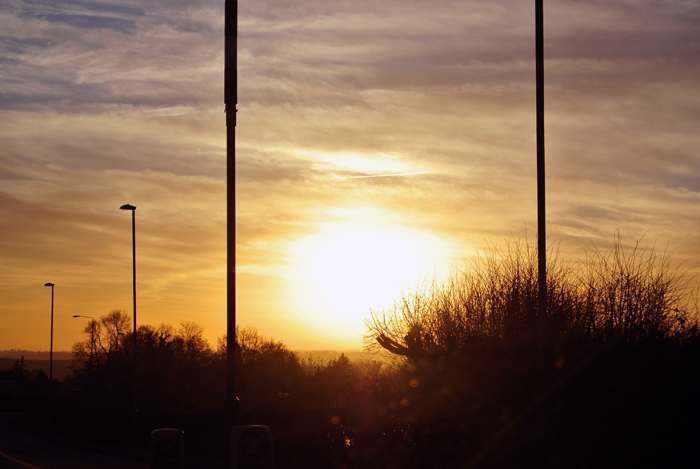 As we were driving home there was the most wonderful sunset. 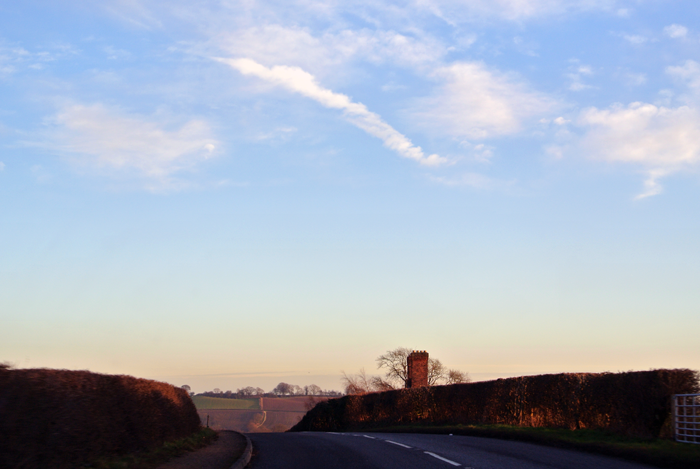 The sky turned a stunning burnt orange colour and there was a distinct chill in the air. This truly is the most wonderful time of the year. P.S. 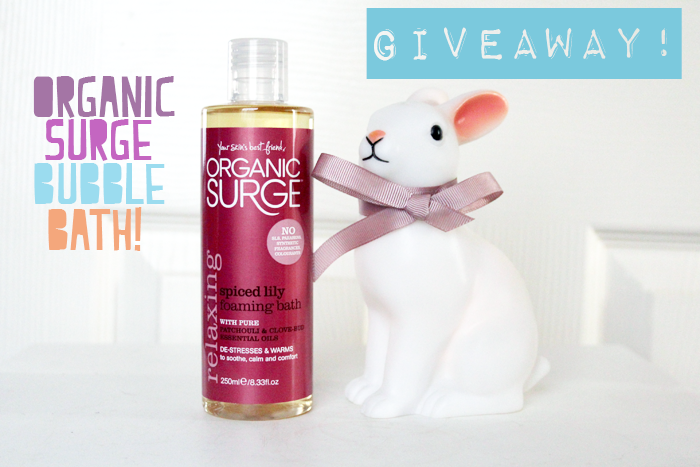 If you would like to be in with the chance to win 1 of 5 bottles of Organic Surge bubble bath (one of my all time favourites!) sign up to their newsletter here & select Sailor Jennie under the 'sign up source' option! UK entries only. Stunning photos! I am a Gryffindor too according to the Pottermore test. My parents have quite the collection of these Victorian village houses and they look so festive each year! My mom has winter villages, and I used to love it when we were little setting them up, including the little ice rink and dotting the trees around. I say get it, they are fun! You look very pretty! I love going to garden centres at this time of year... so many decorations! I had no idea that garden centres did any sort of Christmas displays! I thought you'd gone somewhere very chic until I reached the bottom. 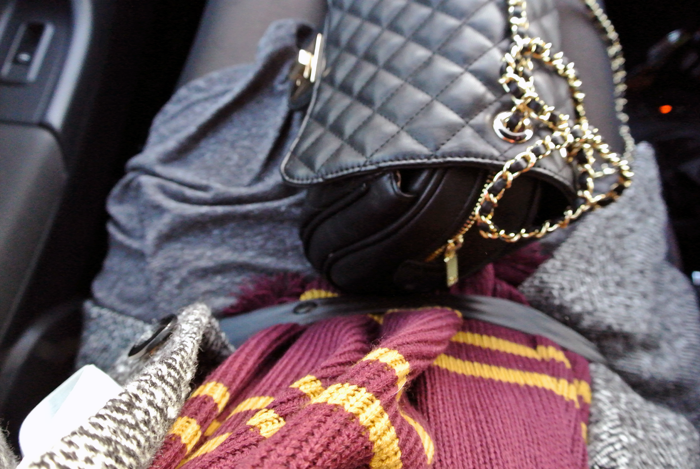 Also, lovely to see a Gryffindor scarf! I am the same with photo's Jennie! I always take about 50 before I find 1 suitable for my blog! Very much liking your stylish bag too! Goodness, your skin is just glowing! You look gorgeous. It is so nice to get into a Christmassy mood isn't it? I start feeling so appreciative of where I live and the people around me. Christmas makes me soppy! I love the Maybelline Falsies Mascara! Have been wearing it everday. Yea Maybelline are doing really well. you're looking great in your face of the day picture! but yaa i know what you mean i'm also one of those people who get super shy and awkward when i have a camera pointing at me! i'm much better with the camera pointing at something else haha. i've always wanted to try to spend a christmas in the UK, everyone's blogs and facebooks and youtube videos make it look so dreamy and festive!! !